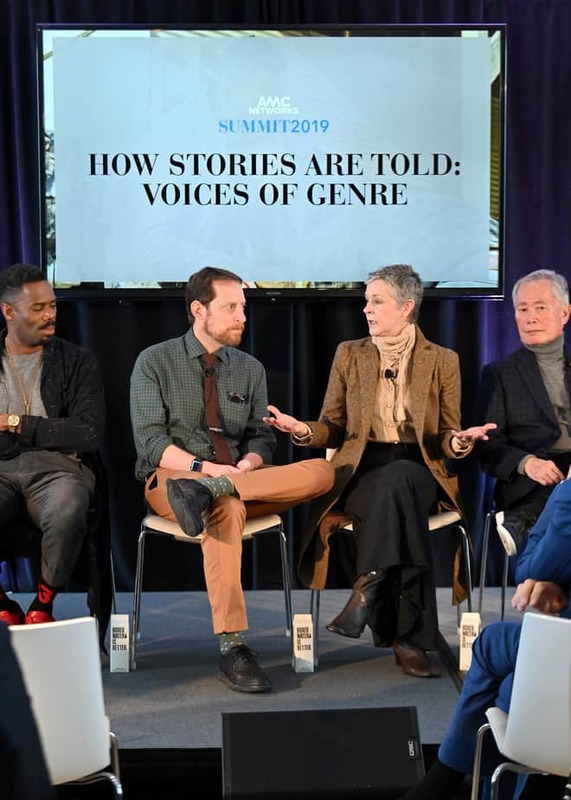 On Monday, April 8, 2019, AMC held its second annual Summit in New York City, holding engaging panels with the actors and producers from many of their popular series. The theme for the panel discussions this year was under the umbrella of “Story Matters”. AMC brought talent from AMC, BBC America, IFC and SundanceTV to participate and those in attendance included Melissa McBride (The Walking Dead), Colman Domingo (AMC’s “Fear the Walking Dead”), George Takei (Star Trek, The Terror: Infamy), Ruth Wilson (BBC America’s “Luther”); Sandra Oh (Co-Executive Producer, Star, BBC America’s “Killing Eve”); Fiona Shaw (BBC America’s “Killing Eve”), Jodie Comer (BBC America’s “Killing Eve”), Scott Gimple (Chief Content Officer, AMC’s “The Walking Dead” universe), and Deborah Harkness (Author of A Discovery of Witches, Executive Producer “A Discovery of Witches”). A third series in The Walking Dead universe has been greenlit for production this summer and is expected to premiere sometime in 2020. The Walking Dead writer and producer Matt Negrete will serve as the showrunner for the new series. The second season of the anthology series The Terror: Infamy will premiere on Monday, August 12, at 9pm E.T., followed by the second season premiere of Lodge 49 at 10pm E.T. BBC America has officially renewed Killing Eve for a third season. In related news, Preacher executive producer Seth Rogen announced via his Twitter and Instagram that the fourth season of the AMC series will also be its last, with the premiere set to air on Sunday, August 4. To keep up-to-date with AMC’s latest news, visit their blog here. In the meantime, feel free to sound off on your favorite AMC series on FoCC! Melanie (Mlgagne) is an actor/producer and a lover of pop culture and the entertainment industry. She is a passionate fan of various TV shows and films, including (but certainly not limited to) PREACHER, GAME OF THRONES, THE WALKING DEAD, RIVERDALE, and X-MEN. She is a regular attendee of San Diego Comic Con (SDCC), and she has attended New York Comic Con (NYCC), WonderCon, and Walker Stalker Con in the past. You can follow her on both Twitter and Instagram @mlgagne.